Dakin Matthews and Jessie Mueller in s scene from the American Repertory Theatre production of “Waitress.” Photo: Evgenia Eliseeva. CAMBRIDGE – When I would be coming home late at night from my part-time job, my refuge while waiting for my bus was the now-defunct Ashmont Diner in Peabody Square in Dorchester. I was usually joined by folks who had just left the many bars in the square, and the Ashmont was a place where everybody knew your name, and where that late night-apple pie and Coke really hit the spot.. The kind of place where Jenna works in the American Repertory Theatre’s world premiere production of the musical “Waitress” now at the Loeb Drama Center. Jenna (Jesse Mueller) is a waitress at Joe’s Pie Diner, “somewhere off Route 27” in what appears to be a small Southern town. As the play opens, there are certain symptoms alarming her and she breathlessly awaits the results of a pregnancy test with fellow waitresses Becky (Keala Settle) and Dawn (Jeanna De Waal). The positive result is not good news in this instance, since Jenna is trapped in a loveless marriage with an abusive lout named Earl (Joe Tippett), and a baby could complicate plans to eventually run away to a new life. 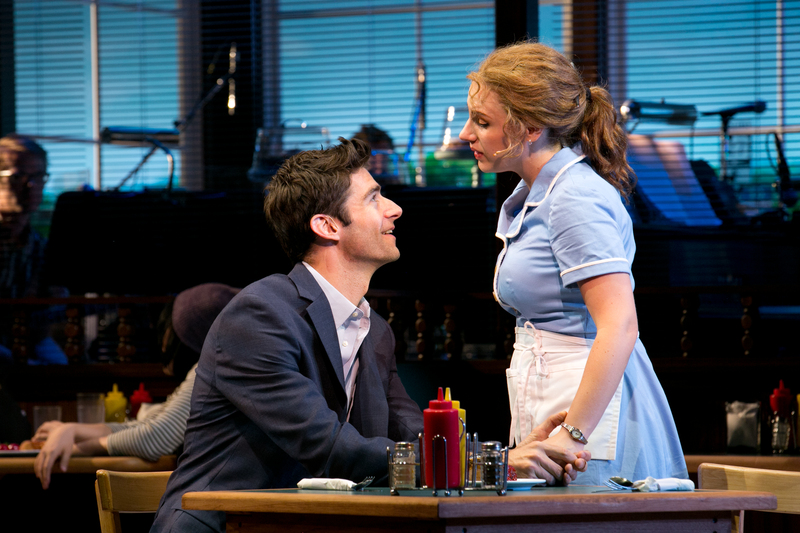 Drew Gehling and Jessie Mueller in a scene from “Waitress.” Photo: Evgenia Eliseeva. If a way to a man’s heart is through his stomach, Jenna has that part down, and while Earl appreciates her baking ability, that’s about all he does appreciate, stealing away her tips and her dreams after he crashes and burns at his construction job. After the large-scale theatrics of “Pippin,” ”Porgy and Bess,” “Finding Neverland” “ and Cirque du Soleil’s “Amaluna,” Director Diane Paulus finds herself involved more in the intimate, smaller-scale doings at Joe’s Pine Diner, and it’s probably a refreshing change of pace for the Tony Award-winning director, dealing with intimate relationships between characters on a smaller scale instead of whether Andrea Martin will fall off the trapeze (“Pippin”). It’s evident that acclaimed singer/songwriter Sara Bareilles is still finding her way as a theatrical composer – some of the numbers screamed “we need a song here” – but generally she seems to be in sync with Jesse Nelson’s book, based on Adrienne Shelly’s movie, and Paulus’ vision, and most numbers mate well with the talents of the cast. “Opening Up” is a catchy tune and there is a haunting, echoing refrain of “Sugar…Butter…Flour” that reminds us of what Jenna learned from her mother and might want to pass on some day. Drew Gehling is Dr. Pomatter, and as Jenna’s OB/GYN is entranced by her pie-making but aspiring to be somewhat more than her doctor — as his nurse duly notes – and Gehling’s sincere, sweet voice melds well with Mueller’s. Setlle as Becky is a source of good-hearted humor and she sizzles in “I Didn’t Plan It.” De Waal is charming as the nerdy Dawn and Jeremy Morse lends some hilarious support as Ogie, the suitor Dawn flushes out of the Internet who turns out to be her soulmate. Nelson also resisted the temptation to paint Jenna as a saint. She appears willing to commit adultery with her married doctor and doesn’t appear early on to be a future candidate for Mother of the Year, but we are still rooting for her to find happiness every step of the way. The second act lags a bit at times as Nelson resolves several plot lines, including which way Jenna’s relationship with the very married doctor will head, her plans to enter and win the pie contest, and her very rocky relationship with her still unborn child. The production and design elements of “Waitress” are simply sublime. Scott Pask’s diner has booths, a counter and stand-alone tables as well as the kitchen where cook and crusty commandante Cal (Eric Anderson) operates. 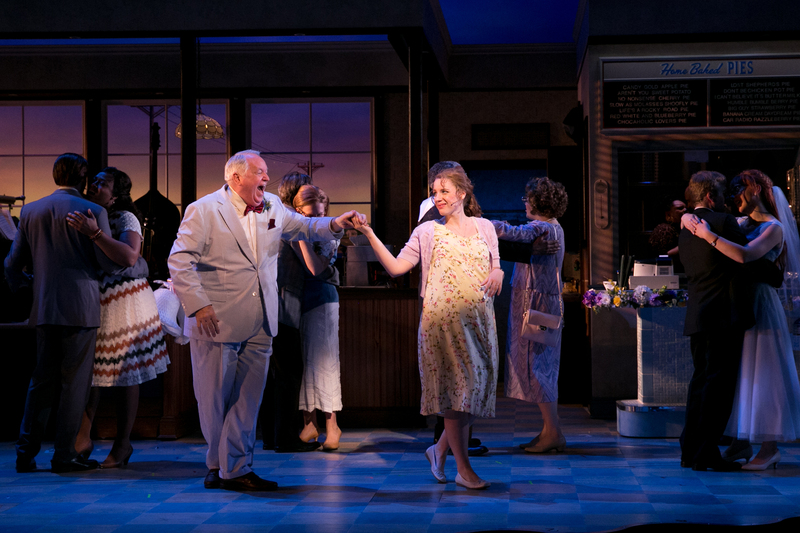 Costume designer Suttirat Larlarb’s creations ring true for both the waitresses and the working class folk, and lighting designer Kenneth Posner and sound designer Jonathan Deans contribute mightily to the atmosphere of a small, sleepy Southern town. The band led by pianist/conductor Nadia DiGiallonardo has been installed onstage in the rear of the set and it works well. There will undoubtedly be some tinkering before “Waitress” reaches Broadway next year, but as long as Mueller is still serving the pie, the welcome should be as warm as that pie fresh out of the oven. The American Repertory Theatre production of the world premiere musical “Waitress.” Book by Jesse Nelson. Music and lyrics by Sara Bareilles. Based on the motion picture written by Adrienne Shelly. Scenic design by Scott Pask. Choreography by Chase Brock. Lighting design by Kenneth Posner. Sound design by Jonathan Deans Directed by Diane Paulus. Costumes by Suttirat Larlarb. Lighting by At the Loeb Drama Center, Brattle Street, Cambridge through Sept. 27. http://www.americanrepertorytheatre.org.